Epique Epique Advanced UV Protection System cream comes in a shiny silver bottle packaging with a pump dispenser, the bottle closes by rotating the pump dispenser. The packaging is classy and quite travel friendly. The sunscreen has a liquidy texture, it absorbs and spreads easily. 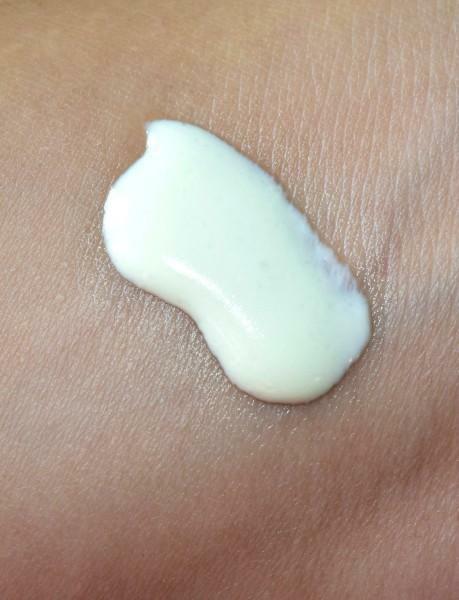 The cream looks shiny when swatched. It has SPF 50 and is broad spectrum which means protection against both UVA and UVB rays. The ingredient list is quite big and I see many root extracts which means it has some natural ingredients as well. I apply this sunscreen sometimes after using toner and sometimes I skip the toner step coz I’ve been getting very lazy lately. It looks shiny and kind of greasy when I look at my face but my face feels dry and tight, you know that 2 in 1 feeling you get from a product, skin looks shiny but feels dry, it’s what I feel when I apply this sunscreen. I have been using this sunscreen regularly and I’m horrified to see what it has done to my skin :shock: It has given me breakouts all over my cheeks, first I couldn’t find out what was breaking me out and then I realized that there’s nothing new in my skincare regimen than this sunscreen so I knew this was the only culprit! I really don’t like products that breaks me out and my relation with them ends then and there, I can’t afford to use them more just to see more breakouts. I have used it enough and got my cheeks full of pimples :/ The only few things I love about this sunscreen is that it has SPF 50 which is amazing, it absorbs quickly, it doesn’t leave any white cast on skin and that the packaging is quite cool.There are more dislikes than likes in this sunscreen, I don’t like that it makes my skin look oily and feeling dry :/ don’t like its high price for such a small quantity and the biggest thing that I don’t like about it is that it’s been breaking me out. Maybe, I’ll have good experience with some other Epique product, this was my first product from Epique and I’m really disappointed with it. Available at: Gurgaon Ambience Mall. PR Sample provided by the brand for review purpose. eeeekSs!!! I would give it -1 if it would break me out!! Such a bad product and KUDOS to you for reviewing it impartially. I always do justice to my reviews, don’t care whether it’s a PR sample or not, the only thing I care about is that my readers should we well informed of all the products, don’t wanna misguide them in any case!! Super duper bad that it caused breakouts..I would not even see this product because I am already having a very bad skin these days. uh!! what a dud…I would definitely stay away!! Yup only SPF factor is good in it! !